Doing yoga at IKEA was really inspiring.Sometimes people think yoga is only for the flexible ones and I was excited to be invited to do this as it gave the possibility of taking yoga to those who might not otherwise consider it. I spent 2 days hanging out with the mood lighting and meeting some wonderful people. 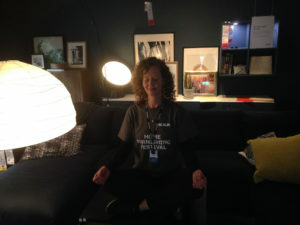 IKEA wanted a safe space for people to come and restore. This involved a range of yoga related things. Anne, who is studying to be a yoga teacher, came with her daughter. We did a chocolate relaxation and talked about becoming a yoga teacher. Kittaya, who is on the yoga foundation course, came with her husband and children. We explored headstands in the ‘kitchen’ and ways to make a safe space… even in IKEA! I think I enjoyed the relief on parents faces most of all, as their children got some fun just for them. I would help the children to play with the coloured lighting and then give them a relaxation story. This was important as you could see many families ‘on a mission’ with the children tagging along. This day really highlighted that in a hectic schedule or a busy place even 5 minutes of yoga can be enough to recharge and refocus. Even if you set a timer for yourself – do what it is your body and soul would really like.